Check out the review of the best condensing tankless water heaters from the top manufacturers: Noritz, Rinnai, and Navien. See the features and specs that make them the preferred choice for heating domestic water in residential homes. Explore all the benefits of the condensing and tankless technology. Condensing water heaters are the most energy efficient gas heaters that are available today. These units utilize two heat exchangers; one, primary, that gets the heat directly from the gas burner and the other secondary, made of stainless steel, that uses the residual heat from the flue gases (wasted energy) to preheat water. This is what increases performance and efficiency while significantly reducing the emission of greenhouse gases and energy. The efficiency of the condensing models is over 90%, where the energy factor could reach high 0.98 on some models. Since the flue gases are cooled down and due to the acidic nature of the condensate, it is recommended for every condensing water heater to use the PVC vent pipe, which is a more affordable solution than the more expensive steel vent found in non-condensing units. The review of the best non-condensing tankless brands and models can be found here. So, condensing water heaters cost more to buy, but cost less to operate. They are bigger as they have one heat exchanger more, but also have a higher energy efficiency – saving you more. The heaters have a modern look and stylish design, with a large LCD display at the front of the unit. 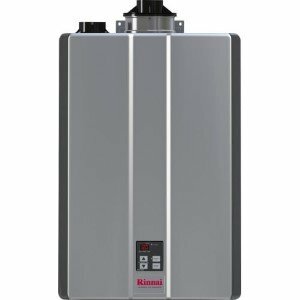 The best condensing tankless water heaters from Rinnai are coming from the RUR line, and are powered by natural gas and propane. Rinnai RUR199i model is designed for an indoor and RUR199e for the outdoor installation, both working with the maximum power of 199,000 BTU and high flow rate of 11 GPM, making it ideal for homes with up to four baths. Except for the residential applications, RUR199 can also be used for heating water in manufactured (mobile) homes. RUR indoor models are unique in the industry because both concentric and PVC/CPVC venting are available in one unit. Both indoor and outdoor models are coming from the new Sensei series, a series with the technology that provides an ultra-low NOx emission and superior energy efficiency of up to 96%, making them Energy Star compliant and eligible for rebates (where applicable). Rinnai RUR199 tankless water heaters are different from other condensing models as they utilize the recirculation system with or without the dedicated line and are comprised of the thermal bypass valve, internal bypass line and integrated circulation pump, all working together for faster hot water delivery time, less energy and water waste. The built-in Rinnai Circ-Logic technology allows you to set the recirculation pattern of your typical use of hot water, so again, you don’t have to wait for too long, especially if the water heater is far away from the point of use. For an added convenience, the mobile app installed on your smartphone allows you to schedule the time for activation or deactivation and when needed, even when on a vacation. With the Control-R wireless module and installed mobile app, you can even allow your Rinnai tech support to check the unit, using the remote diagnostics. What’s the best with RUR199 models, is the Amazon Alexa integration, so you can even use your voice to activate the unit. Very handy feature! These units come with the 15-year warranty. 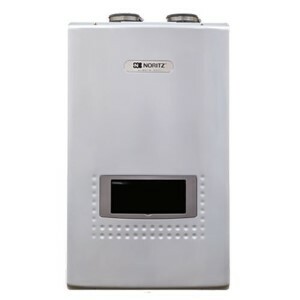 A model Noritz NRCP1112 is one of the best condensing tankless water heaters from this manufacturer, that is designed for indoor use in residential applications only, utilizing dual or single vent systems. With the maximum water flow of 11.1 GPM, it is recommended for high demanding homes, with up to 4.5 showers working simultaneously. If the supplied volume of hot water is not enough for your needs, Noritz has a solution – connecting two of the same units into one system by using the Quick Connect Multi System cable. It cannot be used for space heating. In large homes with the long plumbing lines, delivery of hot water can be slow. And Noritz has the solution for that as well. The built-in circulation pump allows water heaters to work in two different modes; internal and external, reducing the wait time for hot water and increasing the comfort level, and at the same time protecting the unit from freezing as the water is always warm inside the pipes. Since it is designed with the condensing technology, the unit is equipped with two heat exchangers, where the secondary or condensing one is made of the durable stainless steel, which is not only resistant to high temperatures and mechanical stress but also lime-scale deposits. The advanced electronics, led by the electronic board and computer chip, and the LCD control panel, allow users easy control and monitoring, programming, diagnostics and more. Navien condensing tankless water heaters from NPE-A series are the most efficient heaters from this manufacturer and wide. The energy efficiency is amazing 98%, and thanks to the Eco Three-phased Pre-mixed burner reduction of the NOx gas emission is significant. Navien utilizes two heat exchangers, both made of stainless steel which makes them more resistant to stress while providing longer life. The warranty is longer than most other brands, it is 15 years on the heat exchanger. With the two microprocessors built-in, Navien provides better control and safety while optimizing the best performance and giving its users hot water temperature with much less fluctuation. 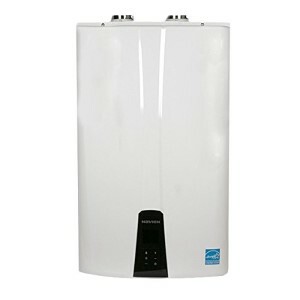 Navien NPE-240A is the tankless water heater with the highest water flow from this manufacturer, 11 GPM, and with the Ready Link System, it connects 16 units into one system, which makes it ideal for big houses and demanding families. The ComforFlow system is the standard feature that combines the internal recirculation system and buffer tank, so hot water is always available no matter of the amount of water, while the temperature fluctuation is eliminated. Another great benefit Navien offers is the air and gas pressure sensor which maximizes the combustion efficiency while making the combustion stable. As other manufacturers of tankless water heaters struggle to build a unit which will deliver a small amount of hot water, Navien uses the buffer tank. Such a setup allows a water heater to deliver the desired amount of hot water to the faucet. As Rinnai, Navien also has an option for Wi-Fi connection and remote control from anywhere. This is optional so as the H2Air combination space and water heating. Condensing tankless water heaters are getting more and more in popularity because of the green technology, savings, enhanced comfort and many advantages they offer. Designed as the next generation in tankless technology, the advanced technology brings an ultra-high efficiency, high-performance level, less gas emission, and energy savings. It is a perfect choice for homeowners who live in large homes and looking for more.